Kieran Monaghan is a primary health care nurse and NZNO member who works at Evolve Youth Service. Kieran is an activist for health and social justice. NZNO CEO Memo Musa adds an update from NZNO at the end of Kieran’s blog. I was recently invited to attend a four-day training workshop on the organising strategies of the Living Wage campaign. The following is a report on my experience, and my reflections between the Living Wage, the Declaration of Alma-Ata and NZNO. The principle of the Living Wage is simply that the labour a person provides is acknowledged by a wage that provides them with the ability to live with dignity and without poverty. The Living Wage differs from the idea of a minimum or poverty wage, which for any worker is inadequate, and may require a second or third job with accounts of people working 70-80+ hours a week, to meet the basic costs of provisions and living. The Living Wage campaign in New Zealand is supported by over 200 unions, faith and community groups across the country. Commitments to proactively work on developing grassroots community connections to advocate for a Living Wage are currently being established. Following the hui, we have set up our own local hub in Newtown Wellington. The current rate for the Living Wage is set at $18.80 an hour and is reviewed and adjusted annually. Impact of the Living Wage in action. At the hui we heard stories about the difficulty of life of low wages, including the impacts on education and health. We also heard the success of nearly 500 workers employed at Wellington City Council, who had their pay rates increased by at least $4 an hour in response to the Living Wage campaign. The WCC parking wardens reported a significant reduction in the work hours needed to earn a sufficient amount to cover the basic costs of living. In addition many now have increased time at home with family. Other workers have reported that moving to the Living Wage has enabled them to dedicate more time on studying towards further qualifications to increase future employment opportunities, so the potential for a better life once again becomes a reality. This is in stark contrast to the workers’ previous experiences where these realities appeared almost impossible to access. As advocates for health and continued well-being, I wonder if nursing could, and maybe should, stand at the front of this campaign in the spirit of partnership, protection, and participation? Health is much more than Health services. From a Primary Health perspective the ten points defined in the Declaration of Alma-Ata outline that providing the most equitable, affordable, accessible care, in a timely and culturally appropriate manner is critical to the health of both the individual and wider community. These foundational tenets of Primary Health Care are an essential part of a systemic strategy to reducing the widening health disparities we are currently witnessing. Minimal low cost housing precipitates overcrowded living conditions, leading to increases in skin infections and rheumatic fever. Healthy food options are significantly more expensive than inadequate options, negatively influencing diabetes and CVD outcomes. Increased prescription charges impact on the ability to buy food and pay bills, the negotiation of budgeting for essentials can lead to less effective treatment for preventable and easily treated conditions. Many of the illnesses we see in Primary Care, and the more expensive option of Emergency Departments presentations, are conditions of poverty and many are entirely avoidable. The now familiar term of the Working Poor represents many of these people. In February 2013 NZNO published a press release advocating for the Living Wage, stating “Poverty is the root cause of much ill health and inequality in this country. Those who are struggling to survive on incredibly low wages are also the people who face barriers to accessing health care, education and other social services when and where they need them.”. NZNO is a member organisation of Living Wage Movement Aotearoa NZ. For NZNO to become an accredited Living Wage employer, ensuring all employees, from the cleaners up, have access to a quality of living free from poverty, would send a strong statement of commitment to the Living Wage kaupapa. 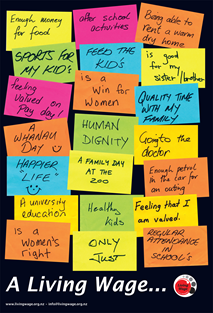 The implementation of a Living Wage is a strategic intervention that could have significant and long term positive benefits to the health and well being of family and whānau in Aotearoa New Zealand. A number of primary health organisations have not only joined the Living Wage movement by signing up as member organisations, but have also become accredited Living Wage employers, paying all staff, including their cleaners, the Living Wage. NZNO to become an accredited Living Wage organisation for all its employees, including contractors, so that it models a healthy standard of quality employment conditions by refusing to pay what amounts to a poverty wage. Find out if there is a Living Wage campaign branch in your local area and offer to get involved and help spread the word. Read more about the Living Wage campaign and share the stories with others. It is inspiring to see unions such at the SFWU, CTU and EPMU among other accredited Living Wage employers and hopefully the NZNO soon will join with them to make a concrete contribution to reducing inequality in Aotearoa New Zealand. NZNO is fully committed to the Living Wage campaign and as such has made a financial commitment to be a member of the Living Wage Movement Aotearoa NZ and priority was first to ensure this support for the movement was up front and can be afforded. All staff employed by NZNO are paid above the Living Wage amount currently set at $18.80 per hour. Contracted staff are not employees, however. So, before we seek Living Wage accredited employer status there are some formal processes and obligations that we have to work through to ensure it is the contracted staff who receive the Living Wage, not the owners of the businesses. Tags: advocacy, collective action, fair pay, Living Wage | Permalink. Fantastic campaign, NCW is also a strong supporter. I expect NZNO will as is usual fulfil it’s duty in this campaign;as it affects the health of our citizens. Well done NZNO leading from the front yet again! Makes me proud to be a member. Thank you for the update NZNO on where the process is at in regards to the Living Wage process. Has there been any discussion or suggestion of timeframe for NZNO? It is great this is being discussed in the open given the two significant reports from last week on the effects of inequities on society at large. its about time that we all take part on this issue.. Thanks for sharing.